We open in an unknown location in what seems to be Metropolis in a seedy rundown building. A mysterious middle aged person molds and sculpts figures from clay. He narrates that when his time passes he will not be remembered but his life's work will never be forgotten. We then cut to the home of the Kent's apartment in Metropolis, Jon gets ready to leave for a night on patrol with his friend and crime fighting partner Damien. The two boys patrol the city, righting wrongs and helping those in need. The Teen Titans turn up later in the night seeking Damien's help. Damien sends Jon home, claiming that he is not a teenager, therefore he is not needed. Jon unhappily heads home, makes it back before his curfew. Damien and the Titans find who they are seeking in three mysterious assailants that manage to take the team down with ease. One of them has a message for Damien, he tells him he doesn't want to kill them, but he does want Damien to bring more of his friends. To his astonishment, an old withered looking Damien stands before him along with all the unconscious members of the Teen Titans. Story - 5: Yet another fantastic issue, the start of what I'm sure will be another awesome adventure for the boys and a great story arc for us the fans to follow. Tomasi is a master at crafting stories filled with mystery, intrigue, heart, joy and spectacle. Just like with the Kid Amazo story, we begin here with an antagonist that is very "shadowy" to begin with, but I'm sure with each issue we will learn just exactly who and what he is after. Now I want to mention, that I do have an inkling on who this character may be, but I won't say so yet, as I have a feeling, that Tomasi may throw us a curve ball to throw us off. As usual, Tomasi captures the voice of both Jon and Damien perfectly. I haven't seen such defining "voices" written for characters since the Avatar: The Last Airbender animated series. 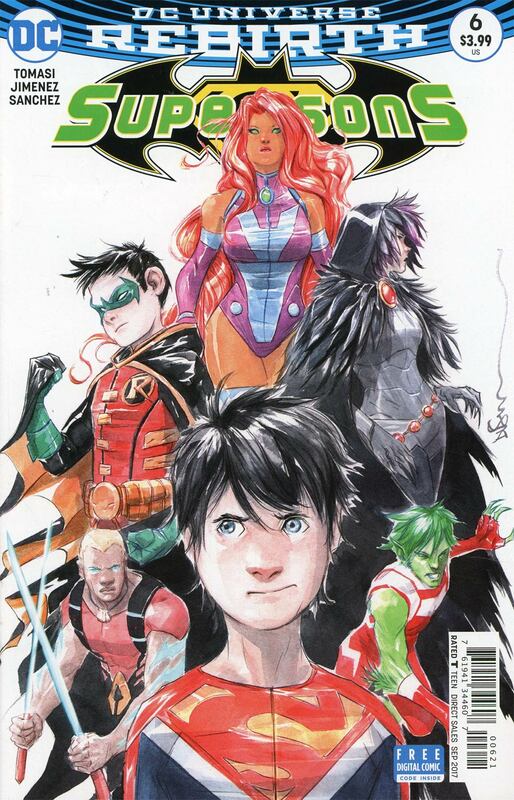 Seeing the Teen Titans in this book makes me want to read a Tomasi written Teen Titans book now. I feel he would be a great writer for that title. Just as he does with our young heroes, Tomasi managed to give the Titans all their individual characteristics also. I loved the banter between them, especially Aqualad's questioning as to why they follow Robin as their leader. Aqualad is a character that I haven't been too pleased with in the regular Teen Titans book. I feel that he was awesome on the Young Justice animated series, but DC editorial just couldn't get him right bringing him into the comic universe. But I digress, I shouldn't be complaining about that here, however I did like what Tomasi did with him this issue. Lastly, I loved the scenes with Lois and Clark at home. This is Clark being who he really is, not Superman or Clark Kent the Reporter, just Clark, married to Lois and father to Jon. Michael Bailey has said many times on the From Crisis To Crisis podcast, that he was once told by a listener and friend that the real guy is Clark that goes home to the Kent farm in Smallville, to see Ma and Pa Kent. And that's exactly who I felt Tomasi wrote in the scenes with him in them. I love this book, and am really looking forward to the next issue. Art - 5: Jorge Jimenez is back again, after a break last issue, and all I can say is, it's good to have him back. This book would not be what it is without his art. Think X-Men #1 without Jim Lee, that's what Super Sons feels like without Jorge. And yes, I just compared Jorge to Jim Lee... What can I say, the man is an artistic genius! What grabbed me this issue was the opening page, we have a mystery villain in a darkly lit room, sculpting the antagonists we see later this issue from mud. Had I not known that Jorge was on the art, I'd be sure I was looking at a Joe Quesada and Jimmy Palmiotti page. I just love the look of those old hands covered in clay/mud, perfect choice of color too. I've always loved the way Jorge separated both Jon and Damien in their body language and personalities. For example, when they both leap into action, Damien has the very cool Batman like leap with his scalloped cape extended just like Batman would. While Jon is in what I would call "happy free fall". Jorge shows that Jon loves to have fun. Further examples are Jon's interactions with people they help along the way through their night on patrol. The way Jon is shown interacting with people and animals emulates that he was raised on a farm. I must also mention that I love the way Jorge draws Lois and Clark at home, Clark without the glasses in his normal clothing, giving Jon a fist bump as he leaves for patrol. Pardon the pun, but what a super dad! My absolute favorite panel has to be the last page. Old wrinkly Robin, I can't wait for the next issue to see what Jorge will do with him further. Now it was an absolute Joy to have the Teen Titans guest star in the book, and I love the way Jorge depicts them all, from Starfire's confidence, Raven's broodiness, Beast Boy's cockiness and finally Aqualad's inexperience. All are masterfully rendered. I know I have said in the past that Jorge would make an ideal Superman artist on one of the regular titles should he get the chance, but now after this issue, I think he would absolutely kill it on an ensemble book like the Teen Titans. Lastly, what can I say about Alejandro Sanchez colors? This issue wouldn't be as awesome without his incredible palette. The man is a master of lighting and contouring. Great job as always guys, anxiously looking forward to the next issue. Cover Art - 5: Fantastic cover! 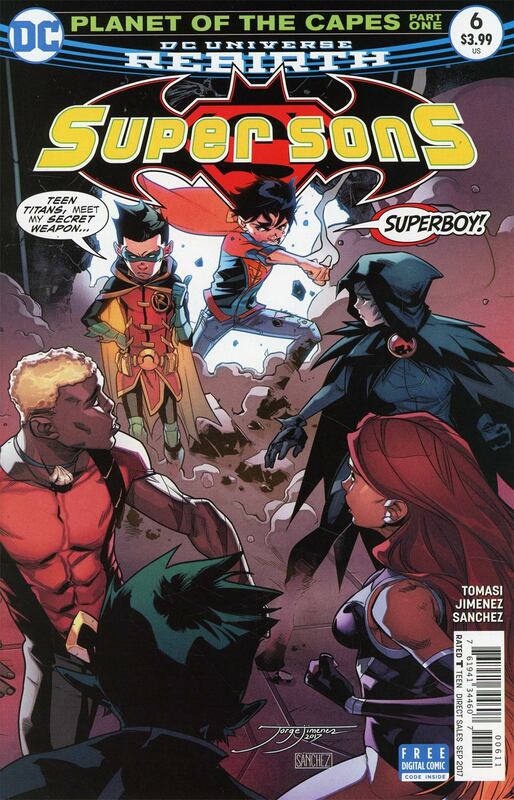 I love the way the Teen Titans are turning and facing Jon and Damien. I'd never been a really big fan of word balloons on covers, but they made it work for this one. Jon looks awesome!